The workshop was offered in conjunction with the 3rd AIAA CFD High Lift Prediction Workshop (HiLiftPW-3), after which GMGW-1 was patterned. The two workshops shared opening and closing sessions. The workshop's test case was a simplified version of the NASA's High Lift Common Research Model (HL-CRM) being used for the High Lift Workshop. Workshop participants were asked to collect and report data about their experience meshing the HL-CRM geometry. GMGW-1 will be held in Governor's Square 12. HiLiftPW-3 will be held in Governor's Square 14. Joint sessions of the two workshops will be held in Governor's Square 15. Meshes generated for GMGW-1 and HiLiftPW-3 are available for download from the HiLiftPW-3 Grids web page. Listed alphabetically by presenter's last name. Peter Eiseman, Program Development Corp.
Members of the GMGW-1 organizing committee will summarize in these presentations the collective experience of the committee members and GMGW-1 participants in meshing the HL-CRM. 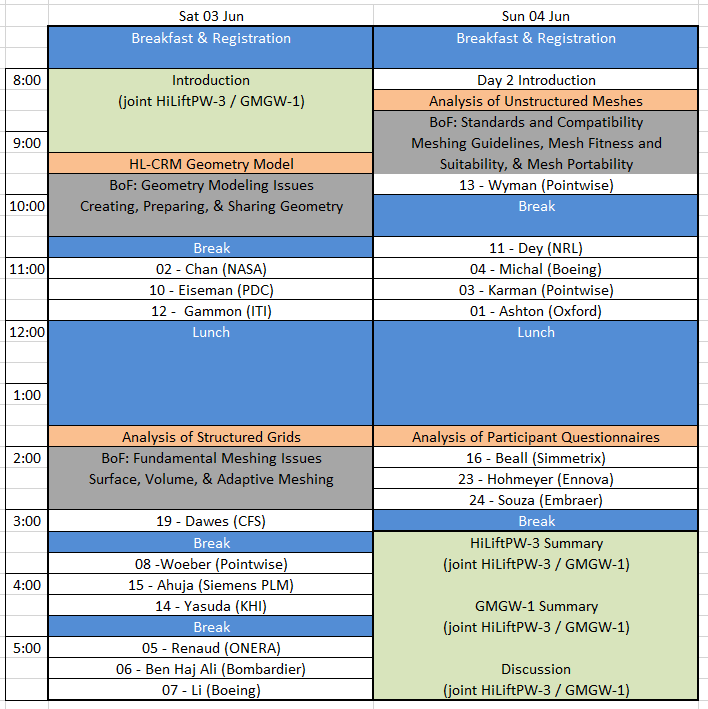 The four presentations will delve into experiences working with the geometry model, generating structured grids, generating unstructured meshes, and the resources required as reported on the collected participant questionnaires. The NASA High-Lift Common Research Model (HL-CRM) has been developed specifically to support the AIAA HiLiftPW-3 and GMGW-1 workshops. This presentation will review how the model was prepared and will describe the Gapped Configuration models that were made available for use by workshop participants. Initial analyses of the geometric differences between different file formats will be provided alongside observations as to their potential implications in the context of mesh generation and CFD. This presentation will be provided immediately prior to the BoF session on Geometry Handling. This presentation describes the techniques used to assess the degree to which each candidate structured mesh system adheres to the meshing guidelines. The primary assessments check the validity of the mesh system, specifically ensuring that the surface mesh points actually lie on the configuration, that all parts of the configuration are covered by a portion of a surface mesh, and that all mesh blocks share common boundaries, thereby precluding holes in the field. The secondary assessments check for mesh quality, specifically the degree to which the mesh satisfies the meshing guideline's on-body and off-body spacing requirements, mesh stretching, and mesh skew. These assessments were performed on all block-structured and structured-overset mesh systems. Assessment of unstructured meshes for this workshop has focused on evaluating mesh spacing (both at the wall and on the surface); confirming topological and geometric consistency of the mesh, determining the distribution of ratio of cell sizes across faces, and determining the distance of surface mesh points from the underlying geometric surface. Comparisons of these results will be presented, along with summary information about conformance with HiLiftPW meshing guidelines. All participants in GMGW-1 and HiLiftPW-3 who generated meshes were required to complete a Participant Questionnaire (PQ) summarising the tooling and methodology adopted, and providing a set of metrics to quantify various aspects of the processes undertaken between downloading the geometry model from the web-site to uploading their final meshes. In asking participants to complete this questionnaire, the objective was to gain a perspective on the nature and scope of contemporary practice, for a range of mesh types, to identify those aspects that were considered to be straightforward and those found to be problematic, and to develop impressions of how the overall process currently “works”. This presentation will review, briefly, the content of the PQ and provide a summary of the results arising from an initial analysis of the responses. to allow the experiences and insights of all participants to be collated for future reference. Each BOF session will allow 40 minutes for group discussion; facilitators will then feedback the key themes (discoveries) from their small groups to all participants. At the beginning of each BoF session, workshop participants will be asked to join the small group of their choice. Facilitated by Dr. Nigel Taylor (MBDA UK Ltd). Challenges in Sharing Geometry: The scope of topics to be addressed by this group includes (but is not limited to): converting models from one format to another, either from a proprietary format (e.g. MCAD – CATIA, CREO, NX, etc) to a non-proprietary format (IGES, Parasolid, STEP), or vice-versa; use of modelling platforms different from that in which the Model was originally created; handling models supplied by third parties. Facilitated by Prof. John F. Dannenhoffer, III (Syracuse Univ.). Facilitated by Hugh Thornburg (Engility). Meshing Guidelines: This topic will focus on the meshing guidelines provided by the High Lift 3 prediction workshop organizers. The guidelines were intended to provide information to guide the construction of meshes with the desired properties. The focus will be on the utility of the guidelines in sufficiently capturing the required mesh characteristics, and communicating and guiding the subsequent construction. Facilitated by Carolyn Woeber (Pointwise). Surface Meshing: Issues addressed may include initial surface discretization type (parameterized patches, tessellation), large number of patches, slivers, maintaining initial CAD edges/angles, surface validity during remeshing (non-manifold, free edges, pierced faces), surface smoothing, surface resolution and transition. Facilitated by James Masters (National Aerospace Solutions). Volume Meshing: This sub-topic may focus on BL meshing (first layer thickness, aspect ratios, number of layers, layer growth, thickness control, highly convex/concave regions), BL to volume mesh transition, volume mesh density and growth, hybrid meshing. Facilitated by Dr. Peter Eiseman (Program Development Corp.). Adaptive Meshing: Issues related to automatic and manual mesh adaptation. Discussion may include topics such as error estimates for adaptation, feature identification, methods for manual and automatic mesh modification on various grid types (unstructured, overset, structured, etc. ), and geometry requirements for mesh adaptation. Facilitated by Todd Michal (Boeing). Download this 1-page PDF informational flyer and share it with your CFD colleagues to help promote GMGW-1.